Planting in these areas impacted by flooding may be delayed—resulting in significant economic impacts for producers. Experts from the Iowa State University Extension recently shared their insight regarding flooding in Iowa, western Illinois, and eastern Nebraska. This flooding is expected to have an impact on soils and producers across these regions. 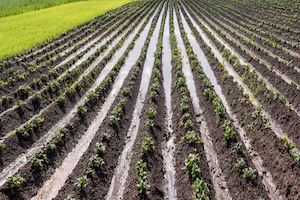 As the experts note, planting in these areas may be delayed or may not be planted to any crop in the calendar year – this could result in a significant economic impact on producers. Furthermore, there may be environmental consequences if flooded fields are left barren. According to the experts, long-term damage to soil should be considered. One potential consequence that may occur is that the biological health of soil may be compromised. The existence of plants plays a critical role in the sustainability of the microbial community in the root zone. “Post flood syndrome,” similar to fallow syndrome, is another potential consequence. Flooded soils may encounter issues caused by the reduction of soil arbuscular mycorrhizae (AM) fungi colonization rates in the following growing season. Additionally, chemical and physical changes to soil may also occur as a result of flooding. Chemical changes will be induced by temporary variations in oxidation and reduction conditions. There are a few ways producers can manage previously flooded soils. Land leveling and sand cleaning can prove to be beneficial – sand removal will depend on the depth of accumulation. Cover crops can also potentially help in the event that a crop cannot be planted this calendar year. More information on how to handle flooded soils can be found on the ISU Extension website at crops.extension.iastate.edu.